Thanks to this courageous recording Offering: The Music of Gil Scott-Heron and Brian Jackson there will be no such thing as an orphaned song by Gil Scott-Heron and Brian Jackson. Ms. Charenee Wade has introduced these to an unsuspecting audience that needed reminding about the grand master of the spoken word, the father (along with The Last Poets, of course) of hip-hop, without its frills, but with almost all of its darker elements. Listening to these songs I am reminded—not that I am not reminded by reading the newspapers every day—that without the conscience of Gil Scott-Heron many would not feel the darkness we live under today as we should. It’s truly “Winter in America” and what a timely reminder for the art of Gil Scott-Heron by an amazing chanteuse, Charenee Wade. 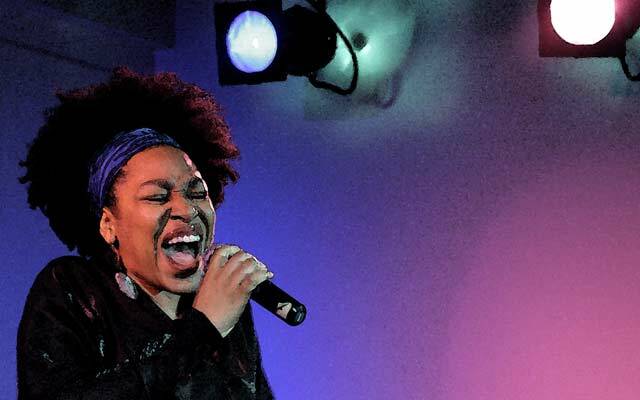 Although played in small venues, with just rhythm instruments and barely a woodwind instruments, and with very small casts, the songs of Gil Scott-Heron and Brian Jackson demand operatic glamour. With her diamantine tone, dramatic flair and free-soaring top—and bottom—notes, Charenee Wade provides it in spades. As a University student living with tremendous existential angst, not the lease because of my colour, I recall memorising some of these songs. These songs as well as “Winter in America”, “H2O Blues” and “Johannesburg” among others were my brief. Much of my own poetry was fashioned after I had analysed the rhythms in Gil Scott-Heron’s tortured lines. I marvelled at the poet’s recitals that I slipped into to discover the America I was experiencing was refracted through a Gil Scott-Heron prism. And now with this remarkable record, I am reliving those defining moments again. 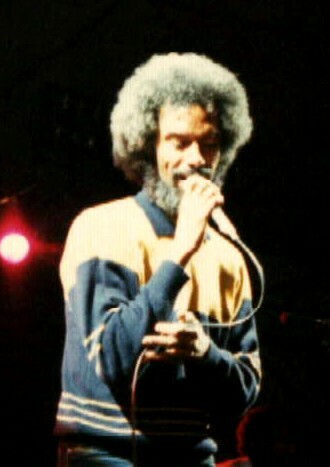 Those favourite songs aside, sadly, Gil Scott-Heron’s songs still tend to inhabit the margins. Although he could produce a tune as luscious and dangerous as “H2O Blues” which descending line was as famous as the poetry, he was not considered to be the generations’ most natural melodists; not was Brian Jackson. Yet, as Charenee Wade’s superb recital reveals, Mr. Scott-Heron’s poetry abounds in novel keyboard setting and audacious harmonies, lushly sensuous in these early and late songs, increasingly astringent as he grew older. Sometimes it feels as if Gil Scott-Heron might be inflating his songs with a degree of sentimentality that seemed uncharacteristic, but the showman never overwhelmed the poet. To prove it he wrote—perhaps even rewrote—some of these songs usually in the direction of concentration: thus songs with flashy vocal lines and cascades of wrist-breaking arpeggios were superseded by the more restrained and subtle settings as recorded here. Even in these chaster songs—more chaste than say “H2O Blues”—many of these recorded by Charenee Wade on this excellent tribute have an operatic expansiveness. In Gil Scott-Heron’s hands and certainly in Ms. Wades, the lyrics remain elaborate dramatic monologues, while in the smokily atmospheric voice the declamatory recitatives with their soaring tessitura alternate with pungent snatches of American rhapsody. Yet several of the most memorable songs here are models of economy: the whirlwind early setting of “Song Of The Wind”1, whose harmonic shocks are the perfect musical equivalent of the melodrama of The Last Poets, and in the loudly accusative “Home Is Where The Hatred Is” the bells of Stefon Harris’ vibraphone dissolves into iridescent sequences of pulsating chords and in the stark message of “Essex/Martin, Grant, Byrd and Till” the soul of the poet quickens the heart. It may be almost obvious from the manner in which Charenee Wade approaches this music that many of Gill Scott-Heron’s songs were conceived for an almost operatic setting. His own narrative of those iconic recitatives correspond to the operatic glamour with which they were written and here, on this record Charenee Wade always hits the mark, whether it is in the fervent climax of “Ain’t No Such thing As Superman” and in the mounting excitement of “A Toast To The People” there is something truly Shakespearean which is to say socially conscious, woven into Mr. Scott-Heron’s own brand of militancy that recalls the clenched fist of Charles Mingus and his strident indictment of Orval Faubus in his illuminating “Fables of Faubus” with the fire and brimstone rap with his drummer Dannie Richmond. 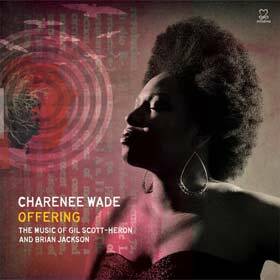 Here as elsewhere the purity of Charenee Wade’s voice of her sustained high and low notes are a priceless asset. She also excels in intimacy, singing “Peace Go With You Brother” with unsentimental tenderness (and avoiding the trap of dragging) and spinning a line of silken delicacy in the secretive little known gem. Elsewhere Ms. Wade perfectly catches Gill Scott-Heron’s ecstatic agitation in her version of “I Think I’ll Call It Morning’ and her blissful languor in the contrasting earlier setting of scorn—even outrage—to “The Vulture”. A born stage animal—very much like Gil Scott-Heron himself—Charenee Wade is equally in her element in Mr. Scott-Heron’s more flamboyant and dramatic song. She times the colours of “Offering” to perfection; in the melancholy mystery of that opening song, where she veils her natural bright timbre, the swagger of the blues melody, the dream-like indolence of the sleeper and the sneering bitterness she brings to “A Toast To The People”; all of this is utterly memorable. A word here about the band is in order: For their ever-observant musicians who are all the vivid colourists and scene painters and who show plenty of Gil Scott-Heron temperament and his evocations. Track List: Offering; Song Of The Wind; A Toast To The People; Home Is Where The Hatred Is; Ain’t No Such thing As Superman; Essex/Martin, Grant, Byrd & Till; Western Sunrise; The Vulture (Your Soul And Mine); Peace Go With You Brother (Intro); Peace Go With You Brother; I Think I’ll Call It Morning. 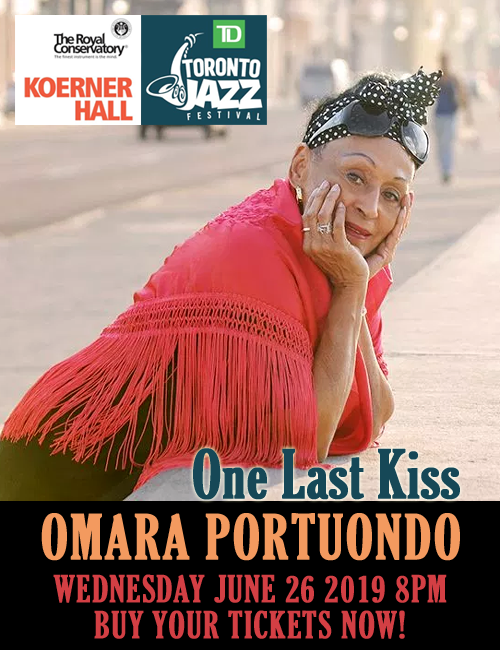 Personnel: Charenee Wade: vocals, arrangements; Brandon McCune: piano; Dave Stryker: guitar; Lonnie Plaxico: bass; Alvester Garnett: drums; Stefon Harris: vibes(1, 2, 4, 8, 9 & 10); Lakecia Benjamin: alto sax (6); Malcolm-Jamal Warner: spoken word (6); Marcus Miller: bass clarinet (6); Christian McBride: spoken word (9).